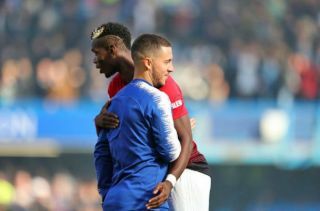 Manchester United midfielder Paul Pogba may have just moved a small step closer to sealing a move to Barcelona, according to latest transfer gossip from Spain. The France international has not had the happiest of times at Old Trafford, struggling to find consistency in Jose Mourinho’s side and not looking a natural fit for the Portuguese manager. And the latest from Don Balon is that Pogba’s chances of perhaps moving to the Nou Camp in a swap deal have just been boosted as Arturo Vidal would seemingly be tempted to accept a move to United in the opposite direction. The report adds that this would have the approval of Lionel Messi after Vidal’s poor start at the club since joining from Bayern Munich in the summer. The Daily Mail are among those to recently claim Pogba wants to join Barcelona this season after a series of difficulties on and off the pitch in Manchester. Paul Pogba to Barcelona in Arturo Vidal swap transfer? Arturo Vidal to leave Barcelona already? The 25-year-old could be a superb fit in Ernesto Valverde’s side, looking the kind of creative and technically skilled player who could really be unleashed in a team with more attacking intent. Barcelona also need someone like that to fill the void left by the recent departures of legendary midfield duo Xavi and Andres Iniesta in the last few years. Another Don Balon report recently linked Vidal with United and this latest update suggests he’d likely accept any offer that came along.